If you experience problems please try one of our alternative download options. server 1: ASAP Utilities 7.6.1 HS Setup.exe (26.5 MB). server 1: ASAP Utilities 7.6.1 HS Setup.zip (26.5 MB). server 2: ASAP Utilities 7.6.1 HS Setup.exe (26.5 MB). server 2: ASAP Utilities 7.6.1 HS Setup.zip (26.5 MB). When you have a slow internet connection then you might prefer to download the smaller setup which is the same but without the 20.0 MB PDF User Guide. server 1: ASAP Utilities 7.6.1 HS Setup NoManual.exe (9.0 MB). server 1: ASAP Utilities 7.6.1 HS Setup NoManual.zip (9.0 MB). server 2: ASAP Utilities 7.6.1 HS Setup NoManual.exe (9.0 MB). server 2: ASAP Utilities 7.6.1 HS Setup NoManual.zip (9.0 MB). server 1: ASAP Utilities 7.6.1 Trial.exe (26.5 MB). server 1: ASAP Utilities 7.6.1 Trial.zip (26.5 MB). 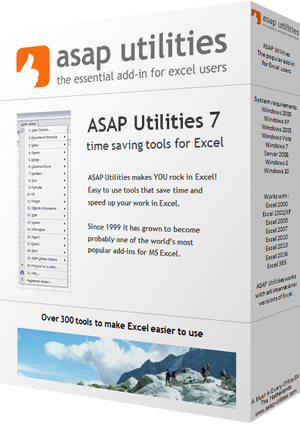 server 2: ASAP Utilities 7.6.1 Trial.exe (26.5 MB). server 2: ASAP Utilities 7.6.1 Trial.zip (26.5 MB). Can't install software yourself and you have Excel 2010 or later? Try this. server 1: ASAP Utilities 7.6.1 Trial NoAdmin.exe (23.2 MB). server 1: ASAP Utilities 7.6.1 Trial NoAdmin.zip (23.2 MB). server 2: ASAP Utilities 7.6.1 Trial NoAdmin.exe (23.2 MB). server 2: ASAP Utilities 7.6.1 Trial NoAdmin.zip (23.2 MB). server 1: ASAP Utilities 7.6.1 Trial NoManual.exe (9.3 MB). server 1: ASAP Utilities 7.6.1 Trial NoManual.zip (9.0 MB). server 2: ASAP Utilities 7.6.1 Trial NoManual.exe (9.3 MB). server 2: ASAP Utilities 7.6.1 Trial NoManual.zip (9.0 MB).